One benefit of handling your hamster daily is that you notice when his physical condition changes. A shiny, healthy coat indicates a healthy hamster. Dandruff is normally a sign that there is a problem with his health, environment or care. The sooner you determine the cause of your pet's dandruff and treat it, the happier you'll both be. Dandruff is a skin condition that causes flaky, white pieces of dead skin to appear in your hamster's coat. Hamsters are self-grooming animals who take care of their own hygiene meticulously, so dandruff is not typically related to hamster hygiene habits. Dandruff in a pet is normally a symptom of an underlying problem rather than the primary problem. Caring for a hamster with dandruff means figuring out why he is having skin problems and treating the cause if possible. Visit your veterinarian to determine the exact cause for his dandruff and provide the treatment your hamster needs. It is not unusual for an older hamster to develop dandruff with or without hair loss. Age-related skin problems that occur in rodents over a year old typically start on the hips or belly, or in the area around the hind legs. As hamsters age and lose fur, their skin can become dry and appear scaly due to a decreasing ability to maintain adequate moisture in their skin. Males are more likely to experience age-related dandruff than females, though both genders can be affected. Mites naturally exist on your hamster's skin and typically do not cause noticeable problems. A healthy immune system keep mites in check, but mites can get out of control or become a problem due to changes in your hamster's health, such as old age, stress or illness. A mite infestation can cause hair loss, scratching and dandruff. In some cases, secondary infections can develop due to your hamster scratching and chewing on areas of skin. Your veterinarian can determine the precise type of mite your hamster is suffering from and prescribe medication to get rid of the mites. A mite infestation does not necessarily mean your hamster has mange, but mange is a possibility depending on the type of mites your hamster has. Mange is a specific type of mite infection that can affect you as well as your hamster. Mange is a contagious skin infection most commonly caused by either Demodex mites or Notoedres mites. Sarcoptic mange can occur in hamsters as well, but it is very rare. Mange infections can spread to and from humans as well as tother animals such as cats and dogs. If your hamster has mange, you may notice he is losing fur, scratching a lot and scabbing around his ears, nose or genital area. He may suffer from dry and flaking skin. Mange requires a consultation with your veterinarian, who will do a skin scraping in order to diagnose the specific type of mange and prescribe treatment for it. Hamsters with mange need to be separated from all other animals and handled with gloves to avoid spreading the mange. A poor diet can cause your hamster to suffer from poor skin and coat conditions. If your hamster's grain feed is less than 16 percent protein, your hamster may not be getting the nutrition he needs to maintain a healthy appearance. Try switching your hamster to a different blend of feed and see if his dandruff improves. Remember that your hamster needs at least a teaspoon of grains and a teaspoon of fresh fruits and vegetables each day. An allergic reaction to something in his environment can cause your hamster to suffer dandruff and hair loss. Certain bedding products, especially cedar bedding, can irritate a hamster's skin much like certain laundry detergents cause skin problems for some people. Washing your hamster's cage in the wrong soap can cause an allergic reaction if your hamster happens to be allergic to that particular product. 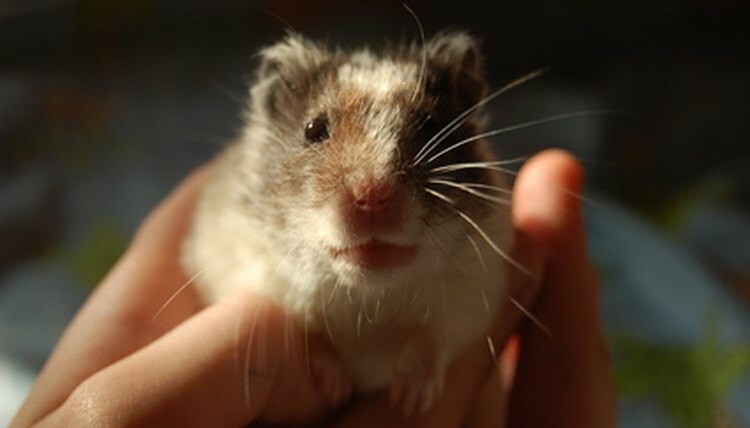 Dyes in your hamster's bedding or food can also cause allergic reactions. If your previously healthy hamster has suddenly begun to exhibit skin problems, try to identify something in his environment that may have changed recently that could be causing the problem. Take the pet to the vet in any case.